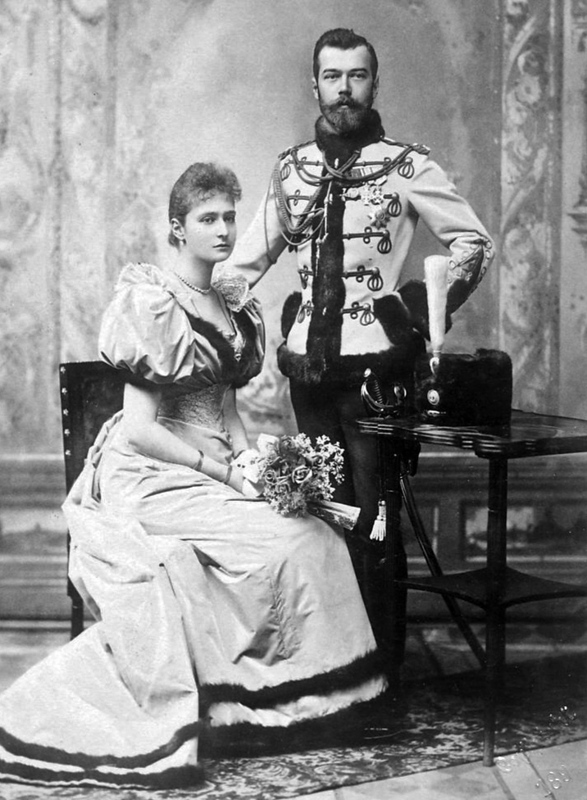 They first met in 1884 when Princess Alix of Hesse (later Empress Alexandra) was 12 and Nicholas was 16 at a family wedding. Since they both sprang from the rarified – and intermarrying – world of European royalty they were not only closely related through multiple lines, but saw each other quite regularly through the years. She made enough of an impression on him that he scrawled in his diary that he dreamed of marrying her one day. Princess Alix of Hesse was the granddaughter of Queen Victoria. The Tsarevich Nicholas, heir to the Russian throne, was very taken with lovely 17 year old Alix when she came to visit her sister Ella in St. Petersburg in 1889. Shy and somewhat serious, Alix was interested in Nicholas as well, but there were plenty of obstacles in the young couple’s path to matrimony. For starters, the Tsar wanted his son to marry a French noblewoman and not the daughter of a minor German prince. Alix was also a devout Lutheran, and any bride of a future Tsar would have to be willing to convert to the Russian Orthodox faith. Considering her level of commitment to her religion, it was widely assumed Alix would never agree to this, despite her love for Nicholas. My dream is to one day marry Alix. I have loved her for a long time, and still deeper and stronger since 1889, when she spent six weeks in St. Petersburg. For a long time, I resisted my feeling that my dream will come true. Most all of Europe’s royalty gathered in Coburg, Germany for the marriage of Alix’s brother in the spring of 1894. Nicholas begged his father’s permission to propose marriage to Alix while still in Coburg. The Tsar was reluctant, but when his son added that he would wed Alix or no-one, believing him to be serious and with the Tsar’s health declining despite only being in his 40s, he ultimately relented. Nicky (as he was known in the family) wasted no time. He went to Alix’s rooms and popped the question. The choice between her religion and her love was a torturous one for the young woman and she initially declined his proposal because of it, hoping he would rescind that requirement. However, Grandmama Queen Victoria, among others, talked Alix into converting to Russian Orthodoxy. By the next day, Alix decided to accept Nicholas’ offer. The following morning, the ecstatic couple had coffee with a delighted Queen Victoria, who was very fond of Alix, particularly for Alix previously having the gumption to slough off family pressure and refuse marriage to Prince Albert Victor, the eldest son of the Prince of Wales, despite the Queen herself pressuring her. At this point, she was already in love with Nicholas. In the end, Queen Victoria was very pleased with the match and enjoyed sharing in the couple’s happiness. Nicky and Alix were an oddity among royalty engagements – a marriage contracted for love. It may have reminded Victoria of her own engagement to her beloved Prince Albert. Not long after their betrothal, the prospective groom’s father Tsar Alexander III’s health continued to unexpectedly decline. Alix was summoned to St. Petersburg, and the couple kept vigil at his bedside with Empress Marie and the rest of the Imperial family for ten long days. Alexander III died on November 1, 1894, and 26-year-old Nicholas II became Tsar. The next morning Alix was received into the Russian Orthodox Church and the new Tsar issued his first Imperial decree, proclaiming his fiancée “the truly believing Grand Duchess Alexandra Feodorovna.” Alix’s first official royal entry into St. Petersburg was during Alexander III’s funeral procession. By spring, they were expecting their first child. Their lives would end in tragedy, killed at the hands of the Bolsheviks in 1918 with their entire family. But until their last breath they seemingly remained as they began, devoted to one another.